I was able to go to an early screening of Robert Zemecki's "Beowulf" at the Metreon (thanks Eric!!). The movie was shown in 3D at the IMAX and the theater was packed. I have never been to a 3D IMAX movie event so I was very curious about the depth aspect. The 3D intro (which I presume plays in front of every movie) was fantastic, I was actually blown away and couldn't wait for the movie to start. Unfortunately, after having seen the movie, more than half the time the 3D was not needed. It was cool at the beginning because it was the first time for me seeing something like that (I saw the Titanic documentary by James Cameron a while ago in 3D but that had huge heavy glasses and it was just 45mins, not a full on movie), but it quickly became annoying. There was some kind of a ghosting effect and the canvas was not evenly lit, overall the picture was very dark, but some areas were even darker. WAIT! That could be because of two reasons. We were sitting a bit on the outside, not full center and sooner than later I will need glasses because far away stuff gets slowly but surely blurry. Not that I'm blind, I can still see and read everything, but it's not super sharp, so that and the seating position could affect the viewing experience. The end battle was brighter (I could actually see something) and there the 3D effect was really cool, not gimmicky (unlike during other spots of the movie where it was downright annoying), but just there, making the experience a notch better than on a normal screen. The story was entertaining, definitely better than most live-action "event" movies, but my problem was with the main character. He's a liar and a cheater (in every sense), so I really don't care about him. Yes, he redeems himself at the end, but that's not enough. I cared more about Grendel or Wiglaf. The look and animation was a mixed bag. Some shots (render wise) looked absolutely breath taking, others a bit cheap and like plastic, which really hurts when it is the characters. The scenes during which you see Angelina Jolie talking to Beowulf are amazing, both animation wise and visually. Most scenes with Robin Wright-Penn are very doll like and dead, both look wise and animation wise. 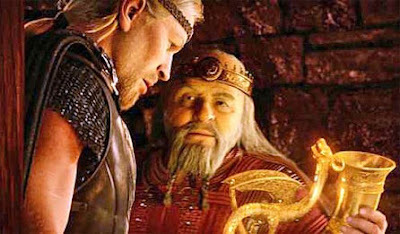 The shots that really worked were the subtle and quiet ones, for instance Wiglaf at the end is really well done. The ones that didn't work were the intense scenes, with a lot of emotion, shouting, etc. Zemeckis still needs to give the animators more freedom to push the performance. One shot that stood out was Beowulf looking for Jolie in the cave. At one point he shouts "Show yourself!" (or something like that). He's only wearing some loin cloth/underwear type of thing, so you see all his chest and stomach muscles. Yet when he screams, only the facial features move (not enough though), but there is no tightening of the abs or other muscles, he just looks like a mannequin. That's too bad because you know they can do it (and they do - at the beginning Beowulf gets naked and lies down, with his arms behind his head and you see all the muscles working, the breathing, etc. all really well done). The sea creatures and the dragon were AWESOME, but when the humans are on horses, the animation quality goes down a bit (movement is too fast and looks like a cycle - towards the end of the movie, other areas were ok). Overall, it was just too inconsistent. Some stuff was amazing, other stuff was Polar Express-y. But I still had a good time and I was pleasantly surprised at how violent and sexual the movie is. It doesn't always have to be talking animals. All they have to do is let the animators do their job and push the look. Since you are in a medium that allows you to do anything, then go for it. Have shots that are like Marlon Brando in "Apocalypse Now", push the lighting, give it more mood and atmosphere. And again, give the animators more freedom. Otherwise, go the "300" route and film your actors and have CG backgrounds. Especially with actors like Hopkins, Malkovitch, etc. Unless you rotoscope their facial performance, it's a waste of talent. It should do well at the box office and will hopefully encourage other studios to produce more movies like "Beowulf". I would have to agree with you. I always thought when I saw the trailer for Beowulf, why CG? Couldn't they have just done it live action with CG backgrounds and some characters? My friends who I went with last night (3d IMAX) thought the animation was better than Polar Express but still looked odd. This was a first for me with the IMAX 3d experience too. There were moment the 3d was amazing and other times used as a gimmick. One friend said at times some of the characters looked like cardboard cut out because of the 3d. Overall, Beowoulf for me was entertaining but not a 'leave the theater mouth open' experience. On a side note. Was that you leaving with Eric T at the end of the movie? Just wondering.. if so I was the asian guy asking him what he's been doing since graduating at the top of the stairs. Sorry, just wondering. I'll have to get my wife to go see this, this weekend. By the way JD, I'm sure you know when you click on the character animation class site, it takes us here to swench and not to the class blog. No, actually I didn't. I did some picture swapping but must have forgotten to update the links. Thanks A LOT for pointing that out (I would have never checked)! !